One. Completely falling apart. I actually repaired the heel end of one of them because it tore. Reason is that every time I go out and buy new ones, they look like nurse's shoes once I put them on and so I take them back. Very difficult to find good looking sneakers for men. Nurses shoes? Where do you shop and what brands do you like? 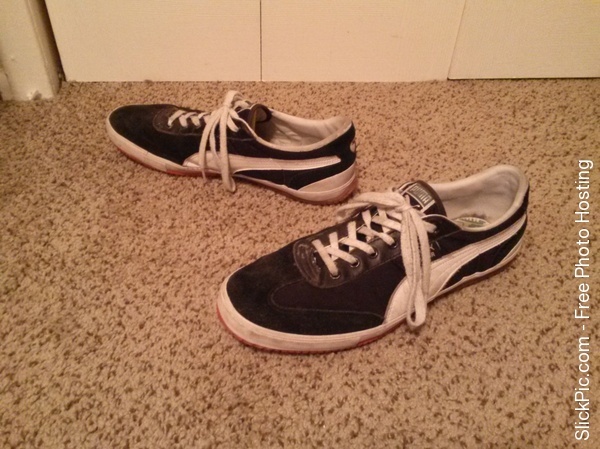 Oh look, a place for me to talk about my PUMAs. I've got three pairs. One "normal" pair with black suede and white stripes, and two racing/driving pair that are low to the ground and pretty much wrap around my feet. Love the design of them. One of those is white leather with gray stripes and the other is a dark blue suede with white stripes. I'm a little disappointed with the latter, as I expected the blue to be a little brighter when buying online. EDIT: Almost forgot to mention: 19y/o male in college. Nice. 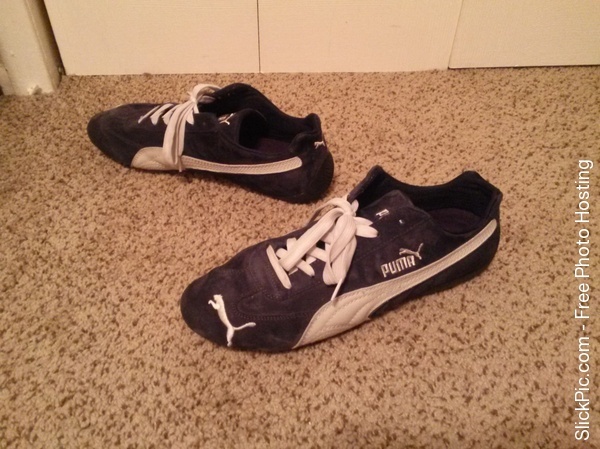 I love Pumas too. You should post pictures of your different pairs. I think my husband owns 3 pair, one for yard work, one for going out and about and one pair in his work truck for the times he does not have to have his work boots on. OK, someone wanted pictures, so here are a few. Meijers, KMart, Penneys, Kohls. I think its those little holes that are put on top to the sides of the lacing. 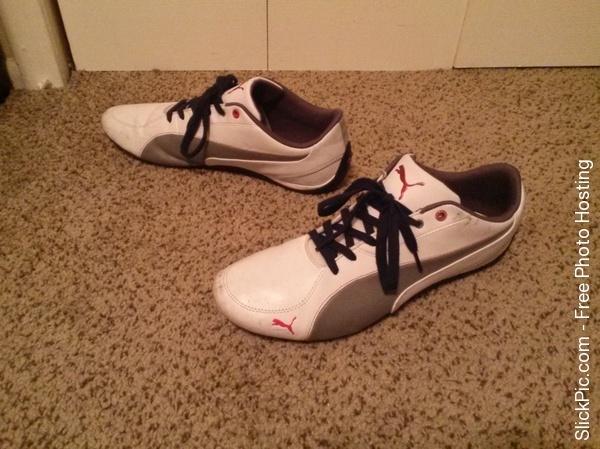 Looks like nurse shoes. I like my tennies to be just a plain middle of the road style with no goo-gaw, but for some reason can never find them. The ones I have now are (or were) mostly white with a small amount of light grey trim and are no name. They were the perfect style. They are about 5 years old or more. I will have to get new ones because now the toe ends are starting to detach and the tops are starting to tear and are worn through. And then of course, nothing looks more nerdy then a brand new pair of tennies that literally scream "Hey! Look! New shoes!. I guess I'll just have to get over that part. 2, one I wear almost everywhere and the other one is an older, worn version. 27 years old. I'd like to dress more nicely, but it's hard to find comfortable shoes when your feet are 4E (bordering 6E) in width and you have a foot that has a caved-in arch. Those are not great places to buy sneakers. No wonder you keep ending up sporting the male nurse look. To me, there's no greater treat than a nice new pair,of funky looking sneakers. Sneakers are my favorite form of footwear and my favorite part of whatever outfit I am wearing. Nice. You've got big feet, man. Have you ever had a pair of the Suede Classic? They cycle down in use....Probably 3. Every couple years I get a new pair for walking and exercising. The ones I previously had get moved to 'yardwork' casual wearing/running around. After that they get saved for camping/boating/dirt kind of stuff...that I can throw away without worry. I'm in my 40s, never been one in the 'hip hop sneakers are fashion' circuit.